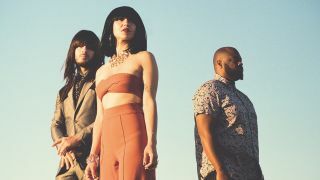 Funky, peaceful, soulful, mysterious… It’s not so much a dictionary you need to describe Khruangbin’s music but a thesaurus, so diverse are the band’s inspirations. Though the band hails from Houston, Texas, there’s hardly a minor pentatonic lick in sight – yet there’s lots of soul in their music all the same. If you combine the reverb-immersed twang of The Ventures with a heady cocktail of melodic influences from as far afield as Suriname, you’re some way to understanding this band’s appeal. It’s been a while since we’ve been so excited by impeccably tasteful R&B basslines such as those played by bassist Laura Lee on standout Khruangbin tracks such as Maria Tembién, or the intricate yet funky melodic riffs of Strat-wielding guitarist Mark Speer. You guys met through church music originally, is that correct? Mark, your guitar lines combine soulfulness with some more exotic flavours. Do you try to channel non-Western instruments in your playing? MS: “Yeah, definitely. I’m trying to make it sound like a voice or like an instrument that’s made out of a gourd, or something that has skin on it, as opposed to just like wood and pickups. “One of my favourite instruments is the Afghan rabab. That has an amazing sound. Nothing else sounds like it. It has this really human quality to it, because I guess the resonant cavity is kind of shaped similar to a person’s [vocal cords]. But aside from that, I grew up with a lot of classical guitar and really loved that style. The Spanish and Brazilian composers and the way that swings – it’d slow down or speed up and there’s just something very emotive about it. So I’m usually trying to emulate vocalists and non-guitar instruments. “I try to listen to as much as I can from everywhere. Like Southeast Asia: Vietnam, Thailand, Cambodia. Those places have a strong surf guitar thing in their musical DNA. Which seems a little odd at first, but it actually comes through The Shadows because they did one of the first world tours – even before The Beatles did. And everywhere The Shadows stopped off, the youth who had seen them started getting electric guitars and playing the music they had heard, but mixing it with music they already knew from their particular region. 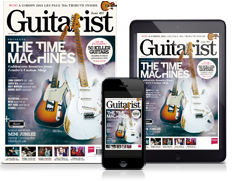 Texas stands for blues guitar to most of the world – did you feel like a misfit, coming from that particular background? Laura, your bass playing is always impeccably ‘in the pocket’, to coin a phrase. How did you develop that fine sense of economy and groove? Laura’s bass seems to provide the melodic backbone of Khruangbin music, with Mark embellishing over the top. How do you write together? LL: “Yeah, he played a line on the Casio and then looped it and just had it playing in the barn. This was in a really, really early Khruangbin session and it was just Mark and me. He had it looping and I just played bass along to it. I’m not doing a whole lot, but what I was playing just sort of sat [right] with it. Then Mark played drums to it and it was a really organic, beautiful thing that happened. “When we tried to record it properly it was difficult to get [the samples] to loop in time with the drums. We had some sort of issue with it, so we decided we had to put the loop on after the fact. As it happened, I was moving to London so we had only 36 hours to get as much material recorded as humanly possible before I left – and that was the last song we were able to record. Mark was so unhappy with it; he was in a real mood. We had to break out the tequila afterwards to make everything okay! “But I remember that I was in London by the time it was all mixed and I got it sent to me. I was on the Underground, experiencing that first few weeks of living in a big city and being packed like sardines, and I had A Calf Born In Winter playing and it was just… I mean, I cried. It was the best moment I had being on the Tube – but hearing the barn. It was beautiful. It somehow worked out. You both get really warm, vintage sounds out of your instruments that are a huge part of Khrangbin’s musical personality. What are your rigs like?